In the City's Public Service Department, many hands make light work. That's especially true for the horticulture crews, who every day work together seamlessly as a team to keep parks, greenways and public rights-of-way looking their best. With all the wet, steamy weather this summer, they've been tackling a seemingly endless series of overgrown parks and public parcels, one at a time. "Our crew will weed, plant flowers and shrubs, mulch and mow more than 100 acres," says Joe Collins, who likes both the variety of his job and working outdoors, even in the hottest stretches of summer. "We weed-eat the banks, and we help Urban Forestry with emergency tree calls. "Especially when it's really hot, we all pull together to finish a project. Some of us will be landscaping, and some will be mowing. It's all work in the same park, so it all comes together at the end of the day. Everybody is helping everybody - it's a team effort." The City Communications Department this summer has talked with City workers who are bearing the brunt of summer's heat and humidity. 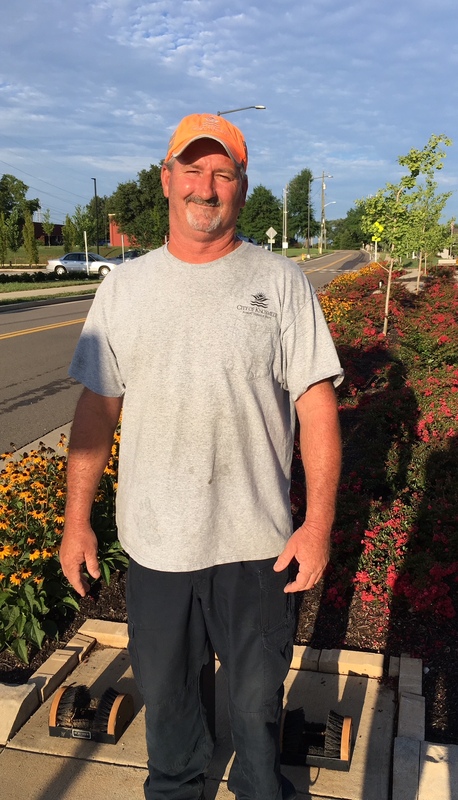 The City Blog series included firefighters, a motorcycle police officer, guys who lay asphalt - and now, horticulture specialists like Collins. Collins shrugs off the suggestion that his job is unusually gruelling. But how about when temperatures top 95 degrees, the sun is beating down and the air is thick and humid? "The body adapts - you get used to being out in the heat," he says. "We take in a lot of ice and water." Still, there are tasks that make muscles ache. "The weed-eat guys, they walk all day long," Collins says. "It's hot, and the weed-eater gets heavy. It probably weighs 20 pounds, but it feels like 50 pounds by the end of the day. "Or, when you're weeding, you're bending over all day. That seems a little more hard during the hot weather." But make no mistake about it: Collins wouldn't trade jobs. He gets satisfaction, seeing the good results every time his crew flexes its muscle and knowhow and whips ragged overgrown parcels of public property into shape in no time. "This is a job that I want to get up and go to work to do," he says. "I love my job."